Founded in 1947 , the Association for Computing Machinery (ACM) is the world's largest scientific and educational computing society, with over 100,000 professional members worldwide. 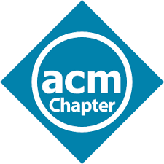 The Poughkeepsie (New York) Chapter of the ACM, chartered in 1961 , meets seven times a year for technical talks. Newcomers, including non-members of the ACM and/or of the Chapter, are always welcome to attend meetings, and even to take a leadership role. The Chapter is always seeking speakers who can give informative talks to a technical audience, as explained in more detail here. Chapter meetings are generally held on the third Monday of January, March, April, May, September, October, and November. However, the exact dates may vary somewhat in a given year, so check our schedule to be sure. Meetings begin at 7:30 PM, and generally end around 9:00 PM, but many members stay longer for discussion and networking, which often last past 9:30 PM. All our meetings are free and open to the public. Our meetings are held at Marist College, usually in Room 2023 of the Hancock Center or in Room 3105 of the Student Center. Attendees can park just north of Hancock Center, or in the parking lot on the south-east corner of Route 9 and Fulton Street. We are grateful to Marist College for hosting our meetings. Prior to each meeting, many of us join the speaker for dinner at the Palace Diner at 6:00 PM. Members are encouraged to join the ACM Poughkeepsie ® group to receive automatic notification of meetings, and to register their attendence. We also email meeting notices to over 500 technology-oriented individuals and organizations in the Hudson Valley.